She's Fantastic: DC Direct's Brightest Day JADE! 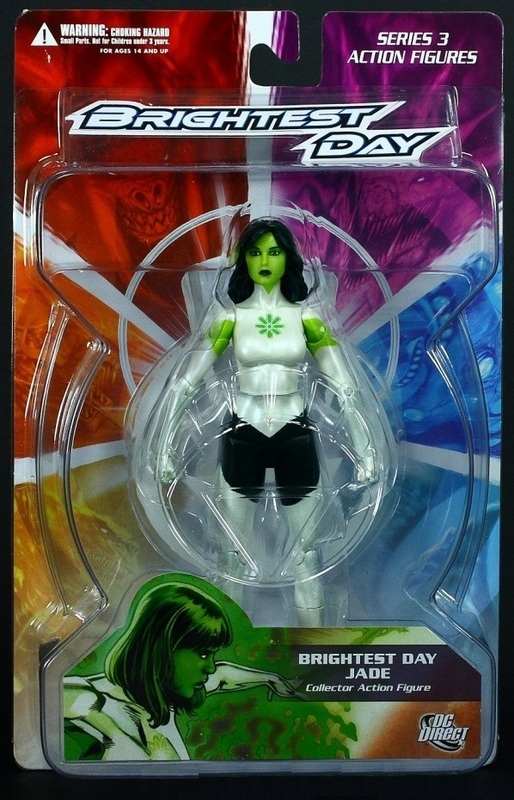 DC Direct's Brightest Day JADE! Jade always seemed to be a highly requested character from DC Direct. She and Mera were on almost everyone's top 10 lists back in the day. Luckily for us, the 2011 Brightest Day storyline (an aftermath to the big Blackest Night Green Lantern event) proved to be a great vehicle for getting some long-awaited characters in plastic. Jade is a very interesting character. For starters, she is the daughter of Alan Scott (the Golden Age Green Lantern) and Rose (aka Thorn: the Jekyl & Hyde-type villain). She has very Green Lantern-like metahuman abilities due to exposure to her father's magical powers. Coincidentally, her skin is green because of her mother's plant-based powers. 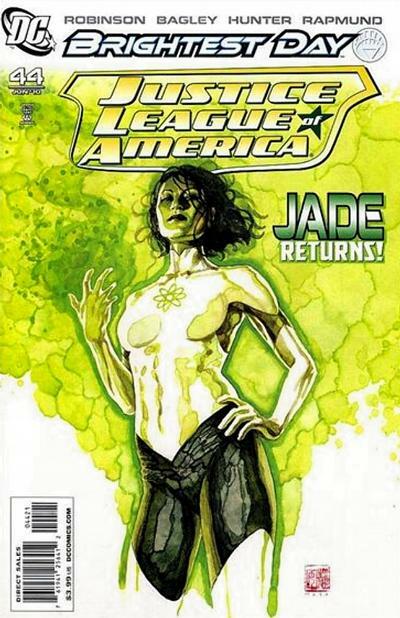 At some point, Jade lost her natural powers and was given a Power Ring by Kyle Raynor (with whom she had a long on-again-off-again relationship with). 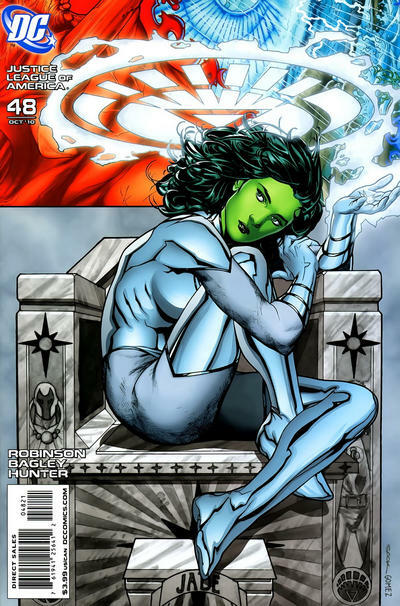 She was killed while fighting Alexander Luthor Jr (son of Earth 3's Lex Luthor) in 2005's Rann-Thanagar War storyline. Years later, during Blackest Night, she was resurrected as an evil Black Lantern, which luckily led to her being reinstated to her true form- and finally an action figure! (Soranik Natu and Dove come to mind). Her face is lovely, but her expression and rather stiff-looking pose leaves her looking little bland overall. Plus, although fans were thrilled to see an action figure of Jade, most would have preferred a more classic costume. Here are some images of Jade in her Brightest Day costume. It's interesting how different the original solicit images were from the final production version. The semi-translucent quality of the face plastic makes the sculpt look drastically different (although when you really compare they seem to be the same). I was a big Infinity INC fan when it came out, so to get this classic Jade fills me with joy. Now, i have Huntress and Power Girl, but if they did Fury (Lyta Hall) would be amazing. But with the new 52 costumes i am out! 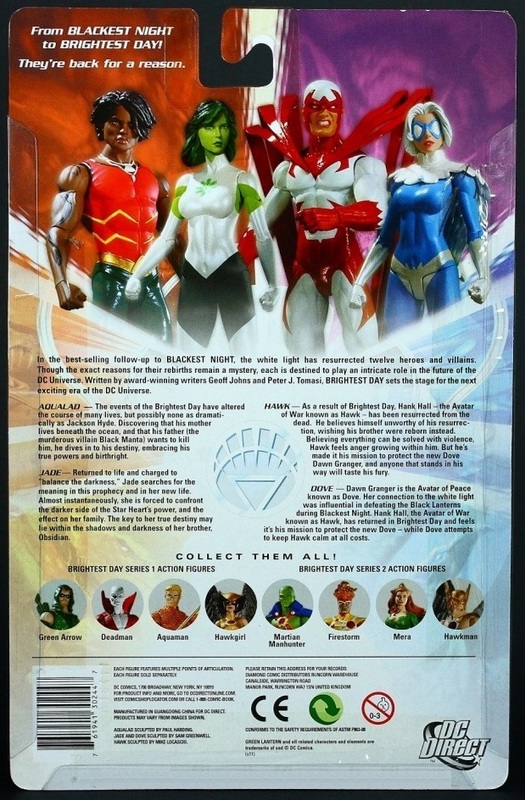 Saying that ive seen the new Power Girl, Huntress and Starfire and they look great! I liked the Infinity Inc Jade, too. However, when I see this Brightest Day verison the differences between the two costumes sticks out like crazy. I would prefer it if she lost the white gloves, swapped that "atomic" symbol for her traditional flower/starburst logo, and I wish the black of her pants was dark green. They're small differences, but in my mind she's SO close ot being a great classic design that I get hung up on it.